Write about your typical crafting time. When it is that you are likely to craft – alone or in more social environments, when watching TV or whilst taking bus journeys. What items do you like to surround yourself with whilst you twirl your hook like a majorette’s baton or work those needles like a skilled set of samurai swords. 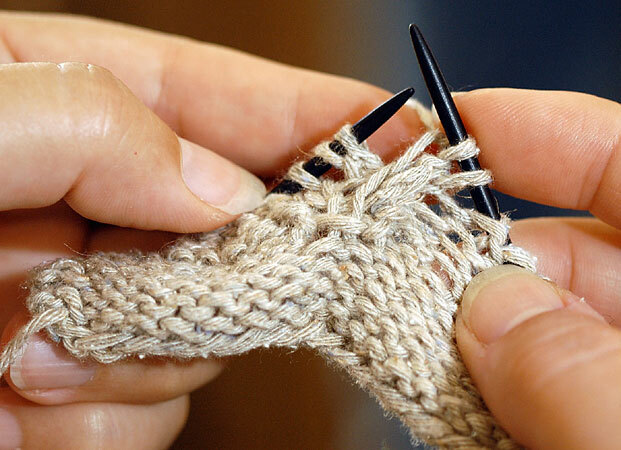 Do you always have snacks to hand, or are you a strictly ‘no crumbs near my yarn!’ kind of knitter... try and concentrate on all of the little aspects that make up your knitting time. Maybe you always head for for your Flaming Lips CD when taking on simple knitting but prefer a bit of Brahms when tackling more intricate work, or maybe you enjoy knitting with audiobooks or complete silence. Perhaps your crochet time is never complete without a cuddle from Tiddles the cat. Most of my knitting time is spent in solitude, as when I knit, it as if I am taken to another world. My pain, worries and problems are all taken away and I can really concentrate on just making something and enjoying myself. If I don't fancy watching TV or a movie, I like to listen to audiobooks, podcasts or even a bit of music. Because of my M.E, I don't get out as much as I like, so when I do go out I much prefer to enjoy being out, rather than spending my time knitting, which is an activity that I can do very easily at home. As to whether I like to snack while I knit, I do. My favourite snack is Blackcurrant Jelly (Or Jello to you American folk :D), as it impossible to get crumbs on your knitting while you're eating it. My dog Lilo, is incredibly jealous of my knitting. Whenever I pull it out, she is always there trying to stop me. Normally she lies on top of my wool, or puts her toys in my knitting bag so that when I look down to get something, I have to play with her. Here is a snap of her in action, the little rascal. Have a lovely and relaxing Sunday everyone! Aww your dog is so cute! and your cake does look delicious!